If your idea of upping the decor game of your apartment or space is posters of things you fancy, Poster Gully is where you need to shop at. They feature work of indie designers who create everything from minimal art prints to full-fledged designs of every genre possible. Pop-culture, DC, Marvel, The Simpsons, Nature, and Anime are all available for you to shop from. They also do laminated framed arts and glass framed arts, which I think is really cool, because then I just have to hang them on my wall without having to spend extra of getting frames done for the posters. It’s an online store, but don’t be skeptical about it. You’ll get your money’s worth. Be sure to sign up for the newsletter, for they keep having discounts and sale almost every other day. Who knows, you could score some neat prints for a steal! Apart from posters, they have canvas prints, giant posters and prints that could probably take up an entire wall, door posters, notebooks, stick on notes, box sets, tote bags, tapestries, mens tees, hoodies, and laptop skins. 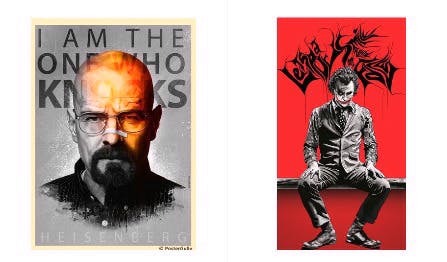 PosterGully Is Selling Unique Designs For Wall Decals, Laptop Skins & Even Phone Covers!